I would like to concentrate this around the phases of your career which are lesser known and not so much the time you spent with Procol Harum. So how did you get into music in the first place? The people who influenced me to get into music were Buddy Holly, The Everly Brothers, Elvis Presley and, later on, guitarist James Burton who played on the early records by Rick Nelson. Even before I left school, playing guitar was the only thing I wanted to do. I had a few jobs, but I packed them in and from quite an early age I just concentrated on playing in bands. Well, yeah my first real professional engagement, anyway, was with Johnny Duncan & The Blue Grass Boys. They played country & western stuff, which I didn't particularly like. I just played it and took the money. Sometime in 1967 I was sharing a flat with a friend of mine up North, who had a haircut like Jimi Hendrix. He'd gone to see some band play at a local cabaret venue. They were a huge show band, but three or four of them had made a record on the side and it had just started going up the charts. They were called Plastic Penny, and they approached my friend, 'cause they were looking for a guitar player and they thought he played the guitar since he looked like Jimi Hendrix. He said, 'I'm not, but my friend is.' I got back that night from a job with Johnny Duncan & The Blue Grass Boys in some working men's dub, and my friend brought these guys back with him from this band. They said, 'Do you want to come along and give it a thrash?' It meant going down to London, which was a big deal. They also wanted a drummer, so I brought along a friend of mine, Nigel Olsson. He and I had been playing together since before we left school and Nigel, of course, later joined Elton John's Band. Anyway, he and I came down to London and we both became members of Plastic Penny. Tony Murray was the bass player; he later joined The Troggs. On piano and organ we had Paul Raymond, who went on to Chicken Shack and UFO, and our singer at that point was a guy called Brian Keith. We did two albums and a Greatest Hits LP for the Page One label over the next couple of years. In reality, we only ever had one hit, which was called Everything I Am. I particularly liked the last few singles we made. But they went nowhere, and so we decided to knock it on the head. People just left the group one by one, and suddenly there were only Nigel and me left. I went along with him one day when he was going out to play with some people who were looking for a drummer. They were bass player Freddie Gandy and singer Stewart A Brown, who had both been in Bluesology along with Elton John, and the now-legendary BJ Cole was there on pedal steel guitar. I wasn't really aware that such an instrument even existed at that point, and the sound of it was just totally overwhelming. That exact combination didn't happen as a group, but in the meantime some promoter had got in touch with me to do some Plastic Penny gigs in Germany. So I thought, 'Why not?' After all, both Nigel and I were still there. We got a couple of the people I've just mentioned, Freddie Gandy and Stewart A Brown, to join us in fact; some of the time we were billed as The Easybeats! You know what these promoters can be like. After that, Nigel joined The Spencer Davis Group. I got a band together with BJ Cole, Stewart A Brown and drummer Willie Wilson, who later became a member of quiver. Our bass player was Rick Wills. He went on to play with Peter Frampton, Roxy Music, Bad Company, and Foreigner. That line-up became Cochise, who existed for the next couple of years. Some people saw us as a country rock band, but we only were to a certain extent. I mean, we utilised the pedal steel guitar, but there were a lot of other influences as well. In between, this Los Angles singer-songwriter Emitt Rhodes came over to London. It must have been sometime in 1971. The guy who used to be in The Merry-Go- Round. Exactly. Now, he had just recorded an amazing solo LP, and the intention was to provide him with a backing of local UK musicians to do a few promotional gigs and a radio session. I was asked to get a backing band together for him in connection with these gigs, which I did. I was super impressed with what Emitt Rhodes was doing on his record. He wrote some fantastic songs, and his voice sounded a bit like Paul McCartney's. He recorded everything himself, he played all the instruments and did all the singing and arranging. So I got this idea of perhaps doing something a bit like that myself. My LP didn't turn out a complete one-man manifesto to the same degree as Emitt Rhodes' albums were, but I did play most of the instruments on it, with the exception of mainly the drums. Funnily enough, one of the songs I like best from that period, On Fire For You Baby, didn't even go on the album as it was recorded at a slightly later stage. It became a single A-side instead. It was written by Dave Elliott, whom I had produced an album for on the Atlantic label. The song did nothing commercially, but at least John Peel liked it. You then formed The Guitar Orchestra. We went into that in details on the notes for the CD release of your album, but I suppose it's still worth mentioning that there was a classical influence on that record. Which leads us on to Procol Harum, I suppose. Yes, I joined Procol Harum in the middle of the recordings for their Grand Hotel album. That was where I met BJ Wilson, who plays some thundering drum solos on the two instrumental bonus tracks on the new CD. After Procol, my main intention was to start my own band. I did get a line-up together and we made some recordings, but they never got released. In between I played a lot of sessions, but I was also with a few bands. I played with The Dukes, for instance, and I was also in Bandit at a stage. In fact, I made an album with them which was produced by Matthew Fisher, who had been in Procol before I ever joined the group. It was a nice album, it had some good songs on it, but it never came out. After that I was mainly playing with a little R&B act, doing lots of clubs. That's the sort of thing I like the best. I did a tour with Fats Domino, which was just absolutely amazing, and recently I have formed a new band, Los Amigos. We have Rick Wills on bass, so in a sense things have come full circle. In an interview with Rob Kelly, Mick Grabham said 'When I made Mick the Lad ... I had this fascination with wanting to try and do it all on my own, and there was no conscious effort on my part to try and sell records. That's why a lot of the songs on that album are pretty nowhere songs, because I wasn't really bothered about the lyrics and the melodies, I was only bothered about putting on a few more guitars ... a good half of the things on there were merely chord sequences that I'd got together, I just put the chord sequences down on acoustic guitar and dubbed everything else on. Grabham completists will obviously want this album in their collections: those who are uncertain whether or not to acquire it should be swayed by the two uninhibited bonus tracks which foreground the drumming of BJ Wilson. On the whole the recording does not exhibit much kinship with Mick's Procol Harum work, but it's going to be fascinating to anyone interested in what can be done with multi-tracking by a guitarist preoccupied with good taste rather than histrionics. Here's a track-by-track survey: please draw your own conclusions. A pleasantly busy bass, and a clangour of multi-tracked guitars, begin this countrified tale of the Sweet Blossom woman coming down the line. The middle section is more mellow with Beatley 'aah' backing vocal and a hint of Abbey Road-era guitar arpeggionics. The backwards guitar solo completes a late 60s impression. Twin guitars lead this guitar-driven boogie instrumental, with the Grabham multi-tracking augmented by saxes, and piano on the left channel. Sadly it fades out slightly ignominiously without really taking the time to make its mark. One senses a Brookerish touch in the diminished seventh chord resolving upwards here, though the thickly-superimposed harmony voices, very American in style, are miles from anything Procol Harum ever did: they bring Neil Young briefly to mind. The harmony vocals are very smoothly done, though the words are not as memorable as they might be. The song has a lovely soupy swimmy playout with Caleb Quaye's electric piano dicing with audibility in the mix, and a wandering, fat-toned guitar solo. Double-tracked rhythm guitars give out with the major sevenths; Mick's bass makes a sinuous entry and a harsh electric rhythm guitar supplies the backbeat. A chord-intensive middle section is soon over; the Mick's doomy vocal keeps up the intensity: his singing accent is oddly unlike his speaking voice! This track is sadly short, at just over two minutes. Here we have phased vocal and piano, and unpredictable chords; then another set of those attractive layered vocals, repeating the title phrase. Again the ear is caught is by fluent, understated bass playing; again, a feeling of Neil Young's in Goldrush period. Curious guitar effects in the solo break, before the gentle voice takes over again. The only disappointment is in the way that the unconventionality of the harmonic progression doesn't extend to the overall song-structure too. Very attractive chords in this twangling finder-picked introduction: yet the more hectic motif that introduces the verse seems to belong to a different song. Now the twin lead guitars are back, but, like the rest of the production, this track doesn't come across with much edge. This is another instrumental, but it's so easy to fit the title phase to the final line of the verse: one suspects that it must have had words at some stage in its development. There's a nice fresh touch in the three-chord figure that takes us into the fade-out. Here's a nice pair of guitars, and a double-tracked vocal that carries more conviction that any other in the set; the track has the freshness of a home demo. There's an intriguingly foggy wah-wah solo, and the wah-wah guitar stays with us for the last verse. Suddenly the voices are duplicated in a final shimmering chorus. 'Your name has been connected with those of us who live': though the words in general are not a high point of the record, these are oddly haunting and allusive. Is this another 'quarter-past' to add to the roster of time-checks in Procol Harum songs (think of Lime Street Blues, Salad Days, and Last Train to Niagara)? Here's an angry-sounding lead part, burning its way over jangling twelve-string and tambourine; it sounds like the introduction, but in fact it's the main melodic interest of the song; when it goes into running semi-quavers one's interest starts to wander to the bass playing instead. The ending, when it comes, is sudden. 'I once knew a woman of the kind you've never seen, with hidden hate behind her smile.' There's a wistful echo on this delicate vocal to start with; and despite the Viking promise of the title, the first extended guitar break has the strongest feel of the English pastoral tradition in the whole set: Pink Floyd in non-galactic mode, or McDonald and Giles playing Turnham Green. Then there's a surprise section where an (uncredited) deep tenor piano creates a dark spell, which is partly dispelled by the re-emergence of the densely-blocked harmony vocals. This is then reinforced by a writhing guitar solo thick with all sorts of effects, which gradually take over the whole sound-field as the four-chord ostinato begins to submerge and we're listening to something like a C3 growling through a Leslie, which I am sure comes from guitars alone. This was a strong conclusion to the original album. This song has a different composer, and was recorded with a different set of musicians (including latter-day Procol bassman, Dee Murray): it was played by an ensemble, yet it sounds remarkably like the rest of the multi-tracked set. But it offers quite a soporific setting for such an inflammatory lyric, and Mick's vocal is surprisingly laid-back for the sentiments? Vocally, he's not 'the Lad' on this album: and the passionate words here actually derive credibility from his subtle, mild treatment, rather than from the sort of cocksure treatment that one hears from Cochise's John Gilbert (who concludes the CD's final bonus offering). But what's this? Snare drum to the fore, a twangsome cowboy guitar strikes up the Shadows' period instrumental, complete with a mellifluous chorus of wordless angels; then the tempo picks up as some comedic saxes start riffing; then there's an impudent drum solo from the great BJ Wilson: he plays 'at the very edge of the rhythmic envelope' in his patent mould, taking every possible sort of risk within the genially cheesy limits of the piece, which is eventually put to bed by some reckless piano. This is a very splendid extra number and makes one wish for more in the same vein. Which is duly delivered! Long before John Barry became a fashionable add-on to Robbie Williams records, Mick tackled this ancient TV theme-tune, which sounds at the outset as if Mungo Jerry had gone on holiday with the Bonzo Dog Band; Pete Wingfield's piano grabs then there's a really great Grabham solo, then a good burst from the uncredited sax-player; then – praise be – there's another drum break from BJ, only eight bars, but bursting with characteristic excitement. Pete Wingfield plays us out with some licks that sound as though they might have originated with Albeniz: another sparkling high-energy romp! 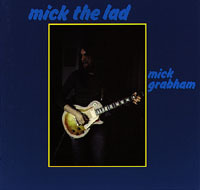 I tend to stop this CD at the end of the previous track, myself: but doubtless there will be those who enjoy John Gilbert's macho vocal stomp through The Wanderer; its guitar break offers a rather studied final exercise in double-tracking from the versatile guitar of Mick the Lad.